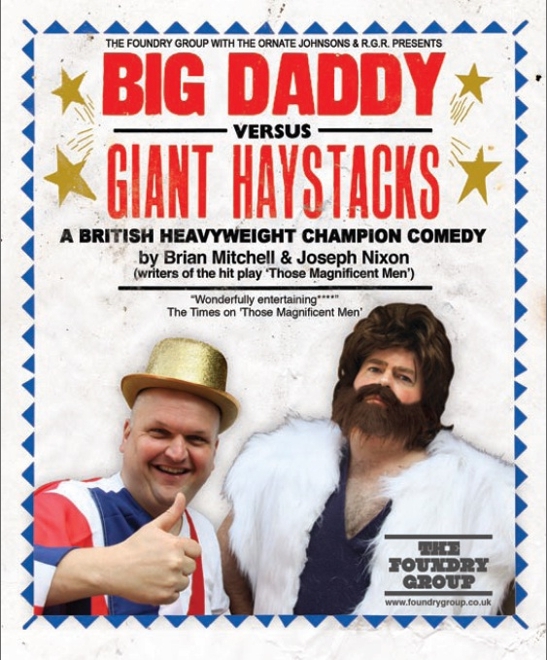 Following an hugely successful run at the 2013 Edinburgh Fringe Festival, Komedia will be touring Big Daddy Vs Giant Haystacks in the UK in 2014. 1976-1988. Two fat men pretend to fight each other. 100 million watch. This multi award-winning comedy/play brings back to grunting, grappling life two hugely popular behemoths and the bizarre world they bestrode. Herald Angel winner Ross Gurney-Randall (Follow Me, Mussolini) and Dave Mounfield (Count Arthur Strong, This is Jinsey) play an all-star cast including Dickie Davies, Paul McCartney, Chris Tarrant, Frank Sinatra and Princess Margaret. From the writers of Those Magnificent Men. ‘Rumbustious writing matched by surprisingly delicate acting… a stormer of a show’ **** (FringeGuru.com). ‘Fascinatingly funny. 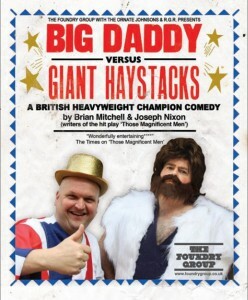 Both hysterical and historically accurate’ **** (FringeReview.co.uk).